It's an age-old question that has stumped the great minds of history: What is the meaning of life? 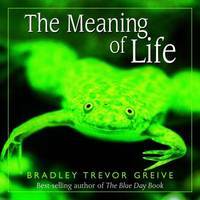 In his hilarious and uplifting style, best-selling author Bradley Trevor Greive finally provides the answer: Figure out what you love and do it. Illustrated with playful photographs of animals, BTG's insightful prose again hits his target straight on. He muses about why we're here and our greater purpose in the grand scheme of things. His informal style provides a refreshing counterpoint to what has always been one of life's big debates. For example, when it comes to discovering your passion, BTG writes, "First, no one else will tell you about it--it's just like walking around all day with a sign on your back that says KICK ME". 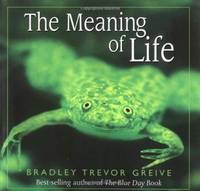 The Meaning of Life is a witty, thought-provoking book that makes an ideal gift for anyone who's seeking their true purpose-and wants to laugh along the way. Andrews McMeel Publishing. Hardcover. 0740723367 Item in good condition. Textbooks may not include supplemental items i.e. CDs, access codes etc... . Good. Andrews McMeel Publishing, March 2002. Hardcover . Used - Good. Slight wear. May have minor sticker residue or marks or writing. Our service is second to no other seller because we use easy to remove inventory tags and try to ship every day so your book arrives quicker! As a small independent book store in the Midwest we thank you for the support. Satisfaction guaranteed in all transactions. Let us know what we can do to help! Andrews McMeel Publishing. Hardcover. GOOD. Spine creases, wear to binding and pages from reading. May contain limited notes, underlining or highlighting that does affect the text. Possible ex library copy, thatâll have the markings and stickers associated from the library. Accessories such as CD, codes, toys, may not be included. Higginson Book Company, 1999. Hardcover. Very Good. Disclaimer:A copy that has been read, but remains in excellent condition. Pages are intact and are not marred by notes or highlighting, but may contain a neat previous owner name. The spine remains undamaged. An ex-library book and may have standard library stamps and/or stickers. At ThriftBooks, our motto is: Read More, Spend Less.Dust jacket quality is not guaranteed. Higginson Book Company, 1999. Hardcover. Good. Disclaimer:A copy that has been read, but remains in clean condition. All pages are intact, and the cover is intact. The spine may show signs of wear. Pages can include limited notes and highlighting, and the copy can include previous owner inscriptions. At ThriftBooks, our motto is: Read More, Spend Less.Dust jacket quality is not guaranteed. Higginson Book Company, 1999. Hardcover. Very Good. Disclaimer:A copy that has been read, but remains in excellent condition. Pages are intact and are not marred by notes or highlighting, but may contain a neat previous owner name. The spine remains undamaged. At ThriftBooks, our motto is: Read More, Spend Less.Dust jacket quality is not guaranteed. Andrews McMeel Publishing. Hardcover. 0740723367 . . Fine. 2002. Andrews McMeel Publishing. Hardcover. 0740723367 Ships from Tennessee, usually the same or next day. . Fair. 2002. Andrews McMeel Publishing. Hardcover. 0740723367 Ships promptly from Texas. . Good. 2002. Andrews McMeel Publishing. Hardcover. 0740723367 . . Fair. 2002. Andrews McMeel Publishing. Hardcover. 0740723367 Ships from Tennessee, usually the same or next day. . Fine. 2002. Andrews McMeel Publishing. Hardcover. 0740723367 Ships promptly from Texas. . Very Good. 2002. Andrews McMeel Publishing. Hardcover. 0740723367 Autographed by author! Ships promptly from Texas. . Fine. 2002. Andrews McMeel Publishing. Hardcover. 0740723367 Very Good Condition. Has some wear. Five star seller - Buy with confidence! . Very Good.